Almost everyone is familiar with the age-old adage, a stitch in time saves nine. It's etymology is based in crafting and it advocates expending a little effort sooner to fix a small problem, thus preventing it from becoming a larger problem requiring more effort to fix later. 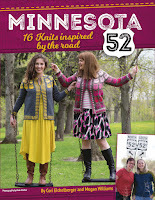 To a knitter that means: darn it now! because mending a small unraveling stitch saves you mending a larger hole in the future. It is a sage saying, one that I wholeheartedly agree with. But I think there is another deeper, more philosophical meaning to the saying that is also learned from crafting. Pivotal in this alternate meaning are the definitions of the words time and save. "In time" can mean not late, but it can also mean a point in time or event. Saving can mean preventing future work, but it can also mean storing. Thus an alternate meaning can be interpreted as "A stitch made at a certain time/event stores nine memories." Caught in each of the stitches I create with my knitting are my memories and my knitting saves or stores memories. 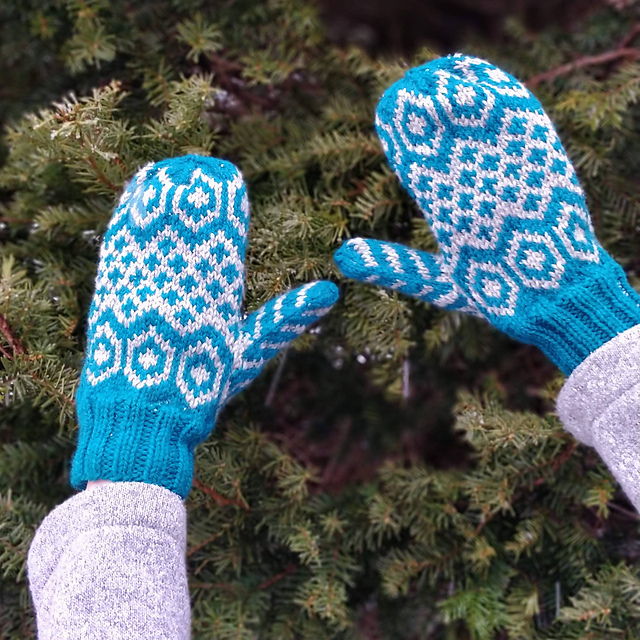 I remember who I knit with, the finished knitwear I saw, what project I was knitting, and course all of the wonderful memories of purchasing yarn, which then leads to even more knitting memories. 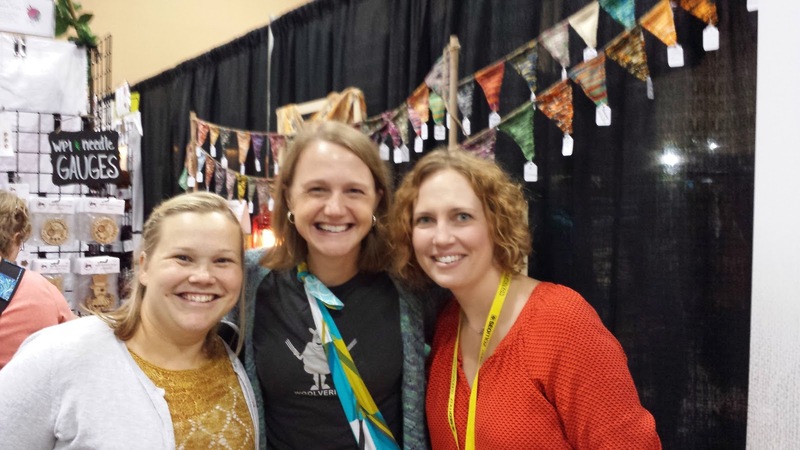 Recently I traveled to Stitches Midwest, a knitting event in Schaumburg, IL, hosted by XRX. The event is the epitome of this alternate meaning of the saying, as I have so many great memories, all because of knitting. In fact there are so many memories it would be impossible for me to limit the number to just 9! For me this event was all about the people! I was able to reconnect with old friends, and also meet new friends. 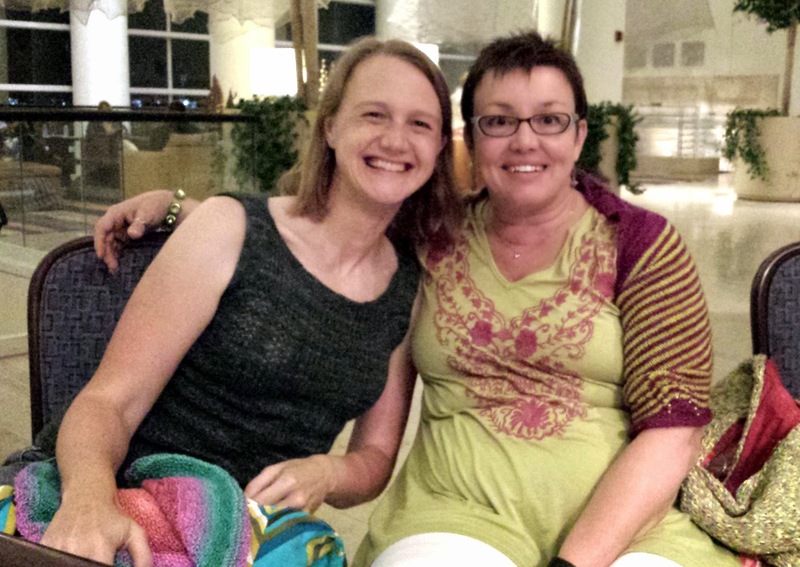 I drove to Illinois with my dear friend Cori, who became a much closer friend when we both took a leap of faith and friendship and traveled together to the same event last year. It was our knitting friendship anniversary! I got to meet a new friend Amanda of Gnome Acres, who was delightful and so.very.funny! She had a fantastic booth set-up that perfectly showcased her gorgeous yarn. I reconnected with the incomparable Sarah of In a Sknit video podcast. Just looking at her smiling face makes me hear her infectious giggle and smile from ear to ear. 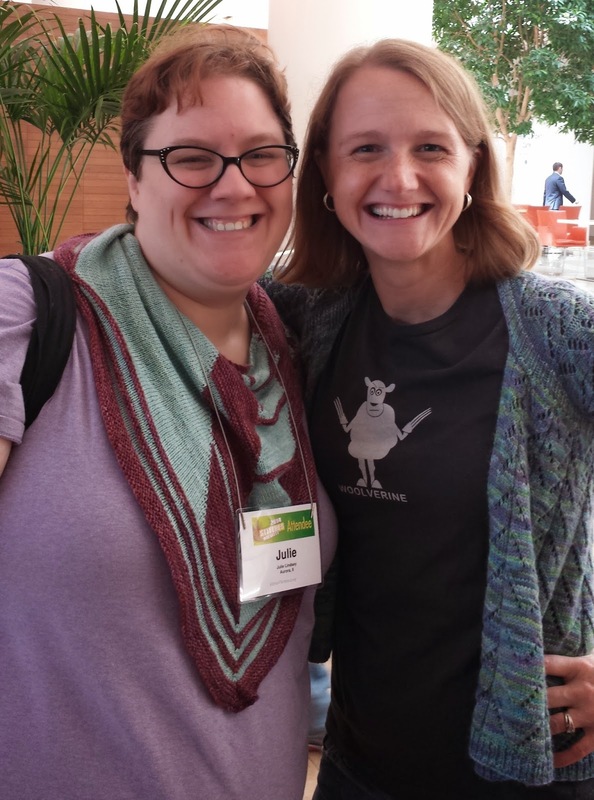 I meet Julie at the Knitting Pipeline retreat earlier this year, and was happy to see her again at the podcaster meet-up! 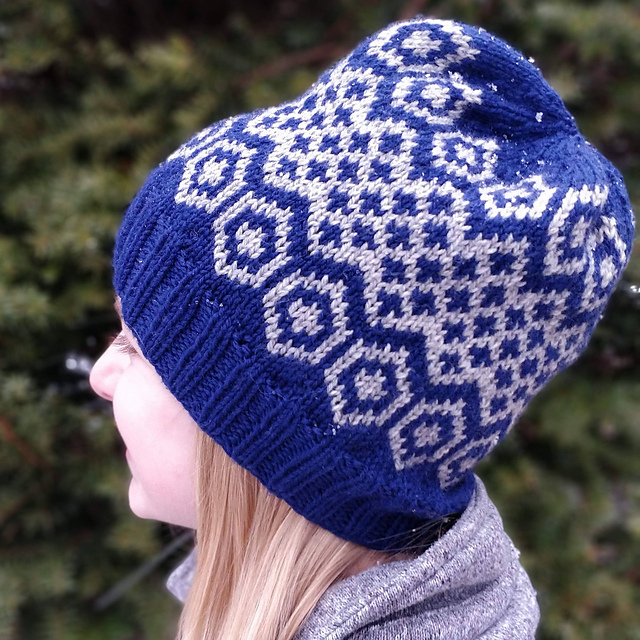 She is the very talented dyer behind the aptly named Happy Go Lucky Yarn. Another new friend was Lucia of the Knitted Paradise video podcast. Not only is she gorgeous, but she is another geek knitter like me. She was also sporting a gorgeous Cool Clavicle Cover, which is one of the first times I remember seeing a complete stranger wearing one of my designs. Of course now she is no longer a stranger! In addition to all the wonderful people at Stitches, I also have memories that soaked into the knitwear I was wearing, and what knitwear everyone else was wearing. 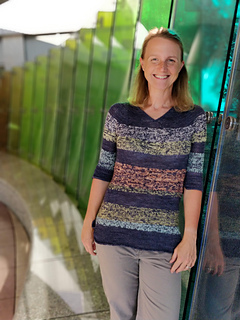 The most noticeable and popular design was the Hitofude cardigan, which were in many marketplace displays and worn by many attendees, including the one I wore. My cardigan has layer upon layer of memories, as I knit my 2nd Hitofude out of Fibernymph Dyeworks which I bought at the first knitting retreat I ever attended SSK in 2012. 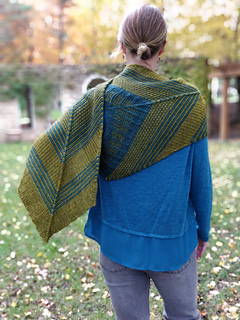 Another popular pattern was the Tan House Brook Shawl. 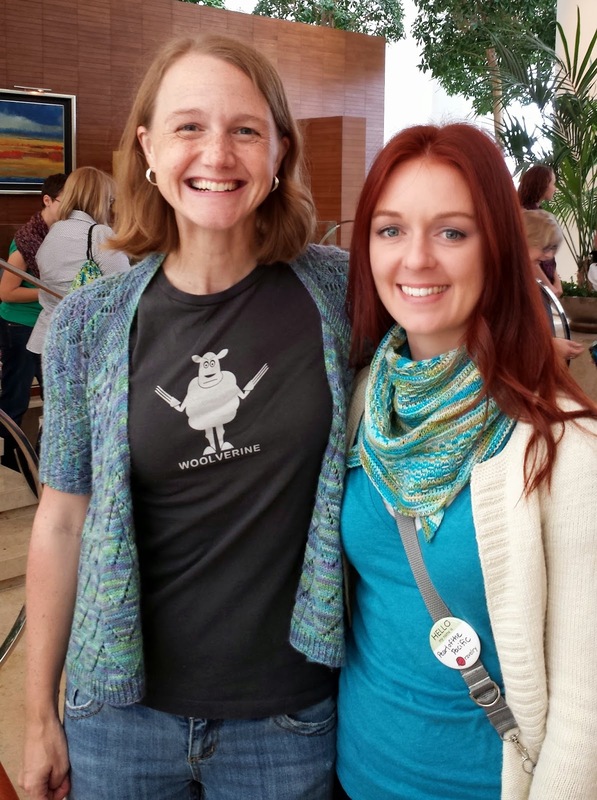 I got to meet the wonderful designer Jennifer Lassonde, who is also a talented audio podcaster. Check her out at Down Cellar Studio. I also wore my latest design Literally Over the Top out of Grinning Gargoyle and happened to run into the dyer Lynae in the market. This garment now has multiple layers of memories too, as I was designing and knitting this top at ZK2014 , and I bought the yarn the previous year at the ZK2013 market. I also brought along my 2nd Cool Clavicle Cover and was able to lend it to my friend Carla (who shall remain blogless) who was cold because of the air conditioning, and that memory is now carried with that shawl. 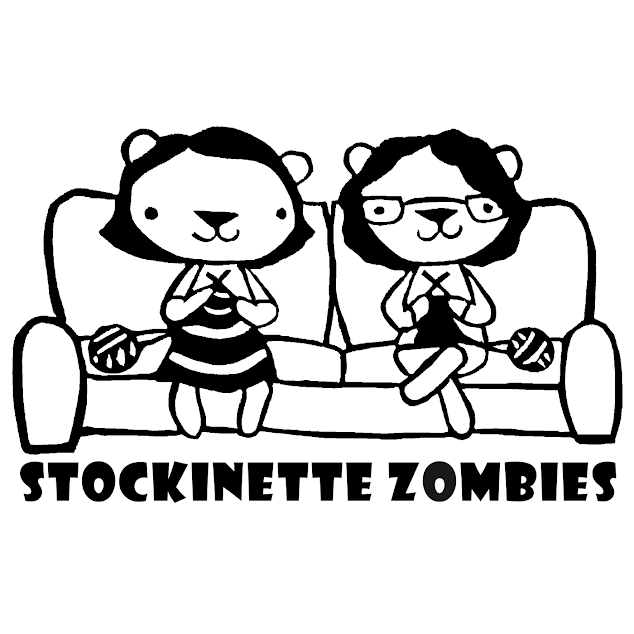 Also included in my Stitches memories are what project I was knitting. I worked almost exclusively on a 3rd Cool Clavicle Cover out of handspun. The yarn was a swap with a very generous spinner, who definitely has memories of all the hard work it took to craft this chain plied Woolgatherings merino bamboo silk. 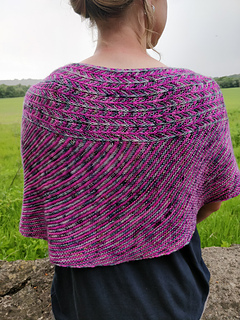 I love how the gradient shows off the construction of the shawl! I recently finished the shawl, and whenever I see it or wear it I will remember Stitches Midwest 2014. And of course there are tons of memories from the epic and so very tempting marketplace. 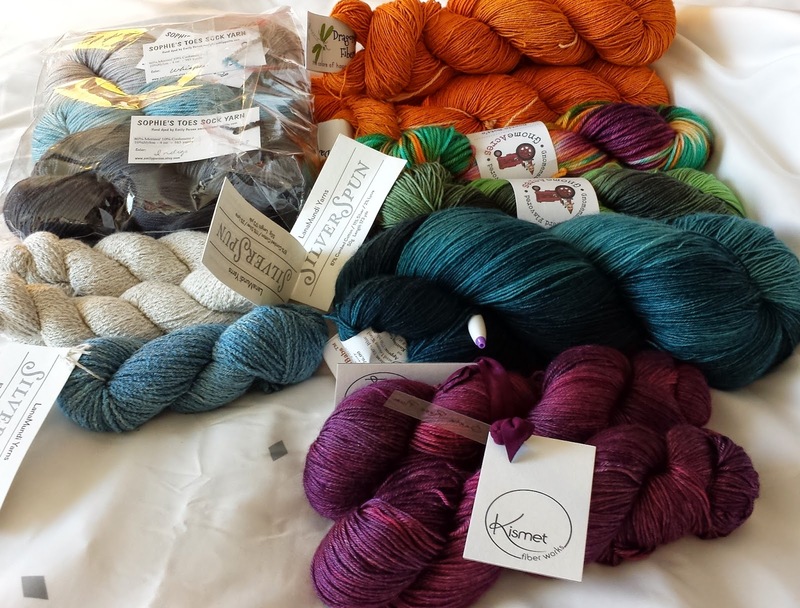 I met so many wonderful dyers and bought so much gorgeous yarn! And all these lovely yarns are the genesis of more knitting memories. I will remember that I bought the yarn at Stitches Midwest 2014, that I was knitting them with other people when something else happened, and I will wear whatever I created to a future event to make more memories. 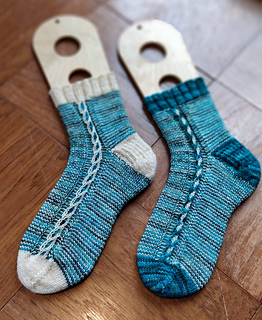 Knitting is so much more than creating a knitted object, it is the preserving of memories in each stitch made and worn. A stitch in time truly saves so much more than nine memories!